So goes the sales pitch from Mars One, the oddball of the space exploration world. In a move that can charitably be described as “puzzling”, Mars One is merging with Swiss mobile payment company InFin Innovative Finance AG. InFin is a small player in a mobile payment field dominated by huge entities like Google, Apple, and Samsung. So, other than ensuring that Mars One astronauts will be able to complete their online shopping without hassle, what is behind this merger? In case you don’t know, Mars One is the Netherlands-based company proposing to send astronauts to Mars and set up a human colony there. There would be no returning to Earth, and the “lucky” people chosen by Mars One to be the first to go, would die there. Mars One has been roundly criticized by the aerospace community at large for its lack of detail and its lack of technical capability. This latest move is unlikely to quell any of the criticism. 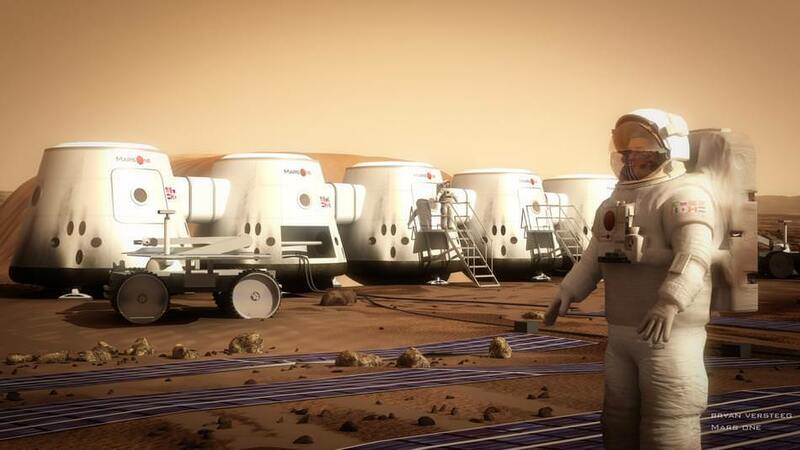 Mars One has had no problem attracting a huge number of applicants to become astronauts and colonists. Over 200,000 people applied, and that number has been whittled down to 100. They’ve been able to attract applicants, and a lot of attention, but one thing they haven’t been able to attract is money. Mars One say they need $6 billion to establish their colony on Mars, but they’ve only raised about $1 million so far, mostly from donations, astronaut application fees, and from t-shirt sales and other merchandise. Yes, t-shirts. Clearly, Mars One needs cash, and this merger gives Mars One access to capital. You see, InFin is traded on the Frankfurt Stock Exchange, and once the two entities have merged, Mars One will be publicly traded. It’s difficult to see how any institutional investors would ever go anywhere near Mars One stock, but it may be an investment for novelty-seekers, space enthusiasts, or true believers. Who knows? A cynic might say that Mars One was just created by Lansdorp as a way to generate some cash from the interest surrounding human travel to Mars. This latest move just adds to the cynicism, since there’s no apparent synergy between a space travel company and a mobile payment company. If the fact that they sell t-shirts to raise money for their Mars colony doesn’t make you question how capable and serious Mars One is, then this latest move surely will. Or, maybe we’re being too hard on Mars One. It’s not like NASA or the ESA has ever inspired a line of clothing, or an opera. Maybe Mars One is an innovator, and is thinking outside the box. Just because space exploration has always been done one way, doesn’t mean it can’t be done in another. Maybe in the final analysis, Mars One will be a successful endeavour, and will show others how unorthodox approaches can work. Only the future knows, and we’re still waiting for the future to tell us. In the meantime, want to buy a t-shirt? If there were an Olympics for ambition, the Dutch-based non-profit organization Mars One would surely be on the podium. If you haven’t heard of them, (and we expect you have,) they are the group that plans to send colonists to Mars on a one-way trip, starting in the year 2026. Only 24 colonists will be selected for the dubious distinction of dying on Mars, but that hasn’t stopped 200,000 people from 140 countries from signing up and going through the selection process. NASA is planning to get humans to Mars in the 2030s, and Elon Musk says he’ll do it even earlier. But they plan to bring people back. If they can provide return trips, it seems a wasteful sacrifice to die on Mars when they don’t have to. Couldn’t successful colonists contribute a lot to humanity if they were to return to Earth after their successful missions? “A living unit will be built from local materials, large enough to grow trees.” A simple sentence, which obscures so much complexity. Will they mine and refine iron ore? What do they have in mind? I don’t want to be a Debbie Downer about it. I love the spirit behind the whole thing. But it takes so much rigorous planning and execution to establish a colony on Mars. And money. How will it all work? In the end, the whole thing is a long shot. Mars One says they have visited and talked to engineering and technological suppliers globally, and that their timeline and planning is based on this feedback. For example, they say they intend to use a Falcon Heavy rocket from SpaceX to launch their ship. But so much detail is left out. The Falcon Heavy doesn’t even exist yet, and Mars One has no control or input into the rocket’s development. While the world’s attention last year was focused on Mars One’s audacious plan to send people on a one-way trip to the Red Planet — not everyone thinks they’ll make it — the private organization has a much closer goal in its sights: landing a robotic mission there in 2018. The goal is also audacious. Only NASA landers have worked for more than a few moments on the Red Planet, and even the agency it has experienced many failures along the way. Mars One is hoping to succeed using the design for the Phoenix northern mission, which is being duplicated somewhat in the upcoming 2016 Insight drill mission. “We’re very lucky to have Lockheed Martin on the contract,” said founder Bas Lansdorp in a phone interview with Universe Today. He noted the company built the Phoenix lander, and that Mars One trusts Lockheed so much that the firm is being allowed to pick its own subcontractors for the mission. Also on that mission will likely be the winner of a Mars One university competition to send an experiment to Mars. Called Seed, the proposal would see the first seed grown on Mars. The plant (called Arabidopsis thaliana, a common feature of space studies) would grow inside an external container that would protect it from the surrounding environment. The team is composed of students from the University of Porto, MIT Portugal and the University of Madrid. “The Seed experiment group, they have really put a lot of effort into creating public awareness of what they are doing, and they collected a lot of votes,” Lansdorp said. While the project also had to meet stringent technical requirements, it was the efforts at public support that were an “important reason” as to why they won, he added. But even now, their flight is not a guarantee. Seed will need to fund the development and construction of its experiment. (Flight costs are taken care of by Mars One.) Also, the group will need to pass technical milestones between now and 2018. If for some reason Seed does not make it, Mars One would instead go to one of two backup projects. These would be selected from the second- and third-place winners, which are respectively, Cyano Knights and Lettuce on Mars. As for Mars One’s funding, the organization eventually hopes to receive money from broadcast rights and sponsorships in association with its crewed landing, which it says would take place in the 2020s. But the money required to fund a robotic mission isn’t available from that revenue source yet. Hence, the organization is seeking an upfront investment in its work to get the money ready for development. Lansdorp said Mars One already underwent an angel investment round, and the organization is now in touch with an institutional group connected to an “institutional fund”, which would also attract money from other investors. Negotiations are ongoing, so the name is not disclosed publicly yet. The goal is to have this investment group fund the robotic mission and the crewed one. The investor’s financial return would come from the eventual broadcasting and sponsorship revenues. Aims of the robotic mission include testing some of the technologies that the crew would later take advantage of, such as extracting water from the planet’s underground and testing solar panels on the Martian surface. Crew selection is ongoing. Mars One did a major culling last year of thousands of candidates, and plans a further selection round that will be announced in February. Would you like to send your great idea for a research experiment to Mars and are searching for a method of transport? The Mars One non-profit foundation that’s seeking settlers for a one-way trip to establish a permanent human colony on the Red Planet starting in the mid-2020’s, is now soliciting science and marketing proposals in a worldwide competition for their unmanned forerunner mission – the 2018 Mars One technology demonstration lander. The Dutch-based Mars One team announced this week that they are seeking requests for proposals for seven payloads that would launch in August 2018 on humanities first ever privately financed robotic Red Planet lander. Mars One hopes that the 2018 lander experiments will set the stage for liftoff of the first human colonists in 2024. Crews of four will depart every two years. The 2018 lander structure would be based on NASA’s highly successful 2007 Phoenix Mars lander – built by Lockheed Martin – which discovered and dug into water ice buried just inches beneath the topsoil in the northern polar regions of the Red Planet. Mars One has contracted with Lockheed Martin to build the new 2018 lander. Lockheed is also currently assembling another Phoenix-like lander for NASA named InSight which is scheduled to blast off for Mars in 2016. The science payload competition is open to anyone including universities, research bodies, and companies from around the world. The four science demonstration payloads will test some of the technologies critical for establishing the future human settlement. They include soil acquisition experiments to extract water from the Martian soil into a useable form to test technologies for future human colonists; a thin film solar panel to demonstrate power production; and a camera system working in combination with a Mars-synchronous communications satellite to take a ‘real time’ look on Mars. The single University competition payload is open to universities worldwide and “can include scientific experiments, technology demonstrations or any other exciting idea.” Click here for – submission information. Furthermore two of the payloads are for sale “to the highest bidder” says Mars One in a statement and request for proposals document. The payloads for sale “can take the form of scientific experiments, technology demonstrations, marketing and publicity campaigns, or any other suggested payload,” says Mars One. “We are opening our doors to the scientific community in order to source the best ideas from around the world,” said Arno Wielders, co-founder and chief technical officer of Mars One. Image shows color MOLA relief with US lander landing sites (Image credit NASA/JPL-Caltech/Arizona State University). Yellow box indicates Mars One Precursor landing regions under consideration. Over 200,000 Earthlings applied to Mars One to become future human colonists. That list has recently been narrowed to 705.